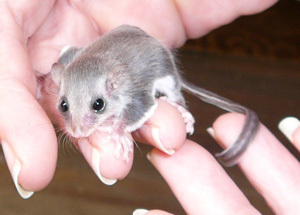 This tiny Glider is the smallest of all gliders with a head and body length of just 6.5 - 8cm. They get their name from their remarkable tail which is flat with stiff fringed hair growing horizontally either side all the way to the tip. 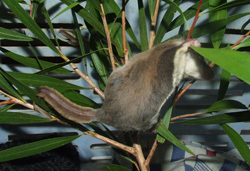 The tail is used to steer and brake as they glide up to 20 meters through the trees. They are the only known Mammal to have a feather like tail. Tail length is 7-8cm and shaped just like the feather on a bird. 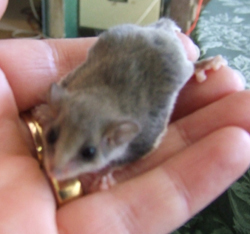 The weight of an adult is 10-15 gram, so this tiny Glider is often missed when in trouble, or mistaken for a mouse when the cat brings it is, which is often how WIRES become involved. 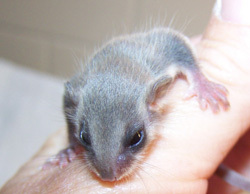 Feathertail Gliders are from the Burramyidae family and are related to the Pygmy Possum. 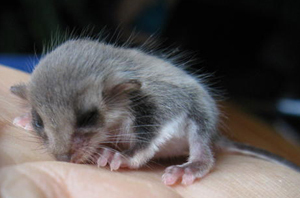 What fascinates me most about these animals is that because they are so small they have trouble staying warm when it is cold or when there is a shortage of food, like the Sugar Glider they enter a state known as Torpor. This means that for short periods, their breathing slows down and the animal becomes unresponsive, the body temperature drops almost to that of its surroundings. 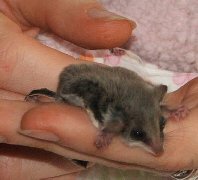 This state is not to be mistaken for hibernation which is for much longer periods and is not known to occur in Marsupials. 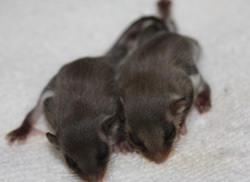 The fur is grey/brown above with light cream to white abdomen. 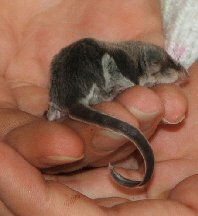 Like all gliders they have a skin fold known as the gliding membrane, in Feathertails this membrane extends from the elbow to the knee. 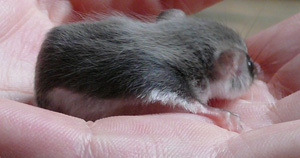 Fringed with long hair along the edge, the body surface is increased. When stretched out, the glider can float long distances, like a falling leaf. It is at home in the trees, feeding on insects, pollen and nectar it launches itself into the air when it needs to get from one tree to the next. 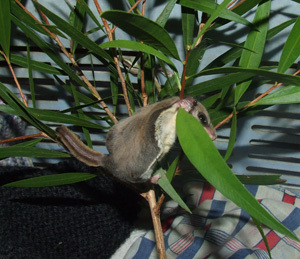 These gliders will build their nests in anything from abandoned bird’s nests to banana bags and line the nest with leaves, feathers and shredded bark. The nest is 6-8cm spherical and closed. Usual nesting places include palms, stag horn and tree ferns. If you have a fireplace and the weather is cold, firewood is what is needed. Firewood is usually taken from an old dead tree, it is dry,and the bark is loose and looks great for use in the fireplace. Please spare a thought for native animals that just as us looks at that old dead tree as something great for keeping dry and warm. 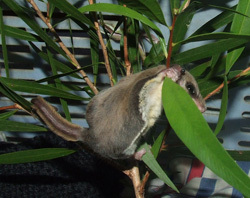 Native animals such as Feather-Tailed gliders often choose trees that either have a nice hollow or timber that has loose bark to make their home, not just each individual but for the whole family. 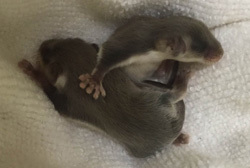 These two little juvenile Feather-tailed gliders weighing just 4.5 and 4.6 gram were found yesterday when they were discovered in a small hollow within an old dead tree being chopped down for firewood. 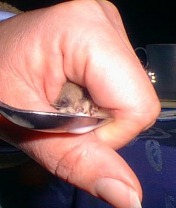 WIRES also receive calls for these small gliders when they are found inside the house after firewood has been collected. These gliders would have been under the loose bark. Please make sure you check under the bark before throwing that piece of wood in the fire, animals such as frogs, gliders and small lizards may be calling it home. 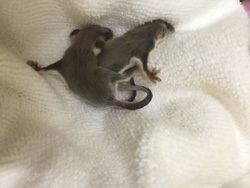 They get their name from Atheir remarkable tail which is flat with stiff fringed hair growing horizontally either side all the way to the tip. The tail is used to steer and brake as they glide up to 20 meters through the trees. They are the only known mammal to have a feather like tail. Tail length is 7-8cm and shaped just like the feather on a bird. 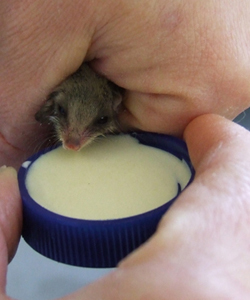 Due to their small size this tiny Glider is often missed when in trouble, or mistaken for a mouse when the cat brings it inside. 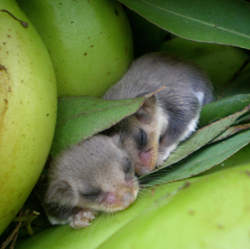 Feather-tailed gliders build their nests in anything from abandoned bird’s nests to banana bags and line the nest with leaves, feathers and shredded bark. The nest is 6-8cm spherical and closed. Usual nesting places include palms, stag horn and tree ferns. 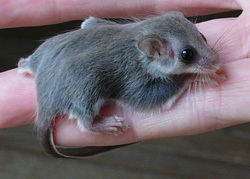 They can at times be found inside the house in winter after someone has brought a load of firewood inside. They may build their nest under the loose bark of old trees as this can be a lovely warm and secure home for these tiny animals. Unfortunately less secure once the timber is taken as firewood. Please ensure you check any loose bark before placing it in your fireplace, not only tiny gliders may be living beneath the bark, so can green tree frogs. 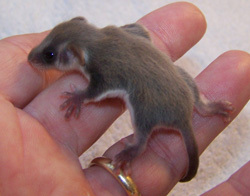 Like all gliders they have a skin fold known as the gliding membrane, in Feather-tails this membrane extends from the elbow to the knee. 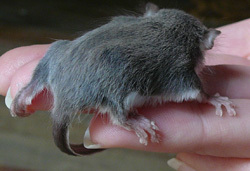 Fringed with long hair along the edge, the body surface is increased. 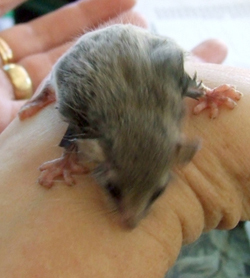 When stretched out, the glider can float long distances, like a falling leaf. It is at home in the trees, feeding on insects, pollen and nectar it launches itself into the air when it needs to get from one tree to the next. To become airborne, they hurl themselves from the tree with legs outstretched; the flap of skin between front and back feet extending like a parachute. 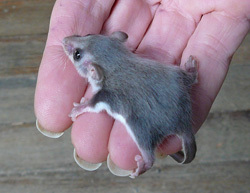 The flattened tail helps this tiny possum to glide, steer, brake and anchor itself on landing. 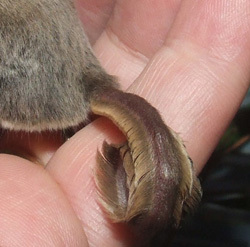 The feet resemble that of a frog except with fur, and the large pads on the toes which have serrated groves underneath allow them to climb just about anything. In fact many sweat glands creating moisture on the foot pads allow this tiny Glider the surface tension like mini suction cups to climb even vertical panes of glass. 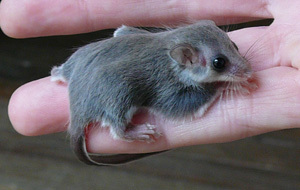 They are found throughout Eastern Australia from South Aust. through to far north Queensland. 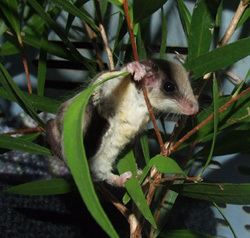 This little Feather-tailed glider was found at Rosebank clinging to a stick in a bucket of water. 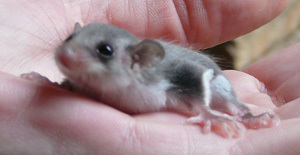 He was suffering from exhaustion and is in care for just 24 hours when he will be taken back and released this evening. The water bucket now has a stick much longer so any critters searching for a drink of water in this extreme heat.can escape should they like this little fellow fall in. He is seen in images below much better after a good feed and some rest. As soon as it gets dark he will be released back to his colony. Thank you to Fred and family for being vigilant and calling WIRES.